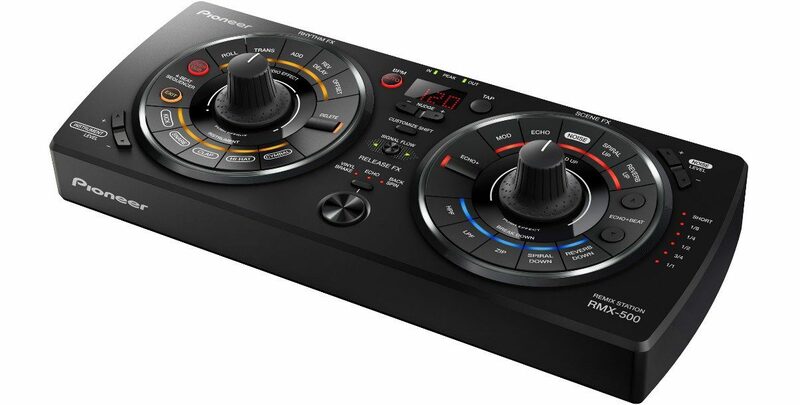 You don’t need to invest in a dedicated hardware effects unit like this one from Pioneer DJ in order to use FX in your sets, as most DJ software and mixers nowadays have plenty of effects built in to choose from. 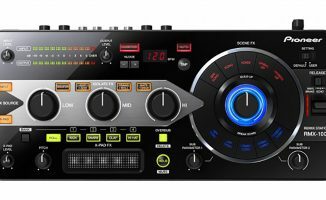 Most digital DJs never touch the effects section on their DJ software. Of those that do, it’s often the case that they discover one effect and abuse it, not adding much to their performance and sometimes even annoying their audiences. And while effects can be a complicated area, especially as most of the tutorial and training out there assumes you’re using effects in a production environment and not in DJ software, they really needn’t be. Any DJ can improve his or her performance by the careful addition of the occasional effect. In this short introduction to DJ effects, we’ll tell you all you need to know about how effects work, what the main types are, and how they’re typically used. 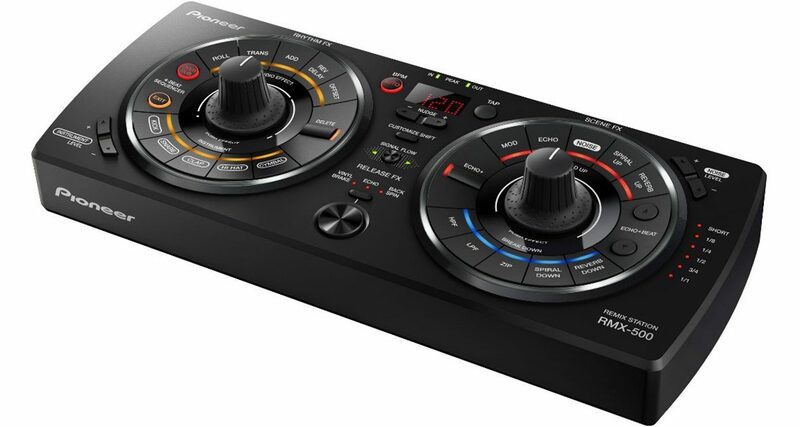 By the end of it you’ll understand what all the knobs and buttons for effects do on your particular software and hardware, whether it’s Traktor, Virtual DJ, Serato DJ, Rekordbox DJ or any of the other programs out there, and you’ll be able to work out how to use effects (whether we’ve covered them here or not). It’s important to bear in mind that effects are one area where software and hardware manufacturers can add a lot of value to their equipment. By coming up with innovative ways to assign and control an ever-increasing number of effects, they can differentiate their offerings from the competition. However, this can make the whole area of effects difficult for beginners to grasp. But don’t despair, because underneath, all effects sections are basically the same. It’s just a case of learning how the basics work on your particular system, then learning the bells and whistles later. Here we’re going to look at the basic controls, then take quick tour of some classic effects, at least some of which you’ll hopefully find in your DJ software/hardware. All effects sections will have some version of the following controls. Try and locate them on your DJ controller, or on the screen within the software. With this button switched off, the effects section is inactive. When it’s switched on, you may not hear the effect because other controls come into play to govern its assignment, but the effect will be working in the background somewhere! Leave this “off” when not in use to be safe. – Sometimes also called “depth”. A “dry” signal is just as nature intended – the pure music coming through your speakers. A “wet” signal is one that has an effect added in addition to the “dry” signal. All effects sections on DJ software and hardware have a control labelled “wet/dry” or “effect level” or something similar, to allow you control the blend of dry and wet. So if this is turned half-way, what comes out of the speakers will be 50% the original tune, and 50% the tune with the effect added. Turn it up all the way, and you’ll only hear the effected signal. – This lets you choose which effect you wish to use. Most software nowadays has a whole range of effects, but most will have at least some of those we’re going to look at here. – These tell your software where you’d like the effect to go. Usually you’d assign it to just one of your channels – say deck A, or deck B, or the microphone input. The software then “plugs” the effect in on that channel only. 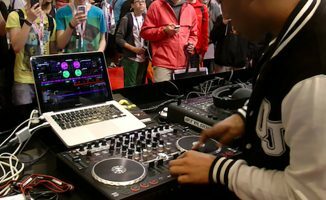 Some software lets you also to assign the effect across the master output – so it is effectively effecting every note that leaves your DJ controller. 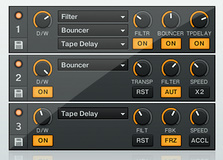 Other software lets you assign multiple effects to multiple channels. – Most software lets you choose whether or not to lock your effects to the beat, or to a fraction or multiple of the beat. Some effects benefit greatly by being “timed” to the beat of the music playing. With these controls, you can choose firstly whether or not you want this to be the case, and if you do, you can choose how quickly the effect repeats in terms of fractions or multiples of a beat. So for instance, you may set an echo to echo every 1/4 of a beat, or a delay to delay the signal for 2 beats before repeating, and so on. These controls may include a “tap” button, for you to “tap” the required time into the software manually. – Some effects have extra parameters that you can also take control over, and these tend to be specific to the individual effect. Once you understand what the effect is and what it does, you can then experiment with the extra parameters to tweak the sound to just how you like it. Here we’ll look at some “classics”, and show you when they tend to be used, plus the kind of extra controls you’re likely to be offered. Remember, manufacturers will offer you all kinds of innovations, which can be great – but all will tend to give you the basics as outlined below. Imagine someone saying “I love you!” to you while you’re both under a duvet together. Their voice will sound completely close to you, inches away, totally intimate. Now, imagine you’re both in a big church or a cave, and the same person says the same thing to you. How would that sound? Obviously, the same voice would sound completely different. The reason is that the space you are in adds reverberations to sound, and so their voice would have depth and colour that you didn’t get “under the duvet”. This is reverb. When it’s used – Reverb is a classic on vocals. It is often used by DJs to make the microphone sound better, especially if someone is singing over their DJ sets. It is a “karaoke standard” effect, as it can add a professional sheen to any voice. (However, overuse it and it just sounds cheesy.) Musically, it can add a metallic, warehouse-type effect to percussion, that sounds like the music is being played in a boiler-room or something similar – great for techno and minimal house, for instance. What are the extra parameters? – You can usually select “size of room” or “room type”, and some reverb effects are incredible good at giving you subtly different types of reverb along these lines. Shouting “hello!” in a mountain valley and hearing your voice rebounded back at you – that’s a delay/echo. It’s simply the same sound, again (and again, and again), usually getting quieter each time until it eventually disappears. Some effects sections differentiate between the two (“digital delay”, “tape echo”), or offer multiple types of each, but they all work on the same principle. When they’re used – Delay/echo effects are a favourite of dub reggae DJs and producers, giving those big basslines that echo off for ages after the initial note hits. But they’re also very common on vocals, echoing the vocal line back rhythmically and quieter a beat or two after it was sung. They tends to work best with clear sounds that have a beginning and an end, ie that are easy enough to repeat. Otherwise, they can quickly sound muddy if you layer indistinct sounds over each other ad infinitum. What are the extra parameters? – Timing is very important with echo, as you’ll usually want your echoes to come back on the beat or on a fraction of the beat. So this is definitely one of the effects you’ll use the tempo function for. Apart from that, the main control is going to be the amount of feedback, or the number times the echo repeats before it disappears – anything from just one repeat up to many, fading slowly off into the distance. 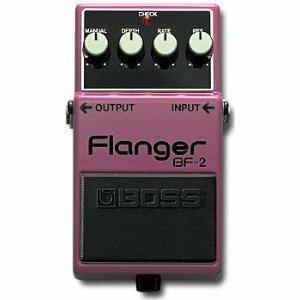 A guitar pedal flanger. Populised by 60s psychedelic pop, the phaser and flanger sounds have been loved by guitar bands ever since and are now available to DJs too. These two effects are related but distinct. You know when a siren speeds past in the distance, and it changes tone even though you know it’s the same noise coming out of the emergency vehicle? That’s a phase effect. It’s often also compared to listening to sound coming from a rotating speaker. Technically, phasing is frequency modulated sound mixed back into the original. Flanging is a type of phasing where delay is also introduced to the signal that feeds back. Effectively, phasing sounds “otherworldy” and swooping, with flanging more pronounced, like a jet taking off. When it’s used – Both come from the guitar world, and are classically used on guitar solos, although also often for a complete track too. They cycle and sweep (ie how “fast the speaker goes round”) and so work well when tied to the BPM of a track, although tend to sound better when tied to longer periods of time than, for instance, an echo effect. However, they also work well left to sweep over even longer periods where rhythm isn’t so important. What are the extra parameters? – You can generally alter the speed of the “sweep” and its intensity, and with the flanger, the amount of the delay. 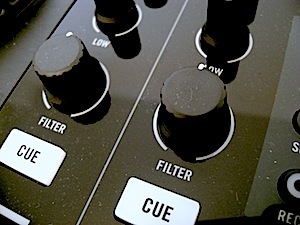 Each of the four channels on the Traktor Kontrol S4 has its own filter knob. Last but definitely not least. Filter is a type of equalisation, so is related to the EQ controls (although not normally controlled by them). There are two types of filter: “low pass filter” and “high pass filter”. The former lets low frequencies through but curtails high frequencies, the latter does the opposite. Filters are more than variable EQs though: they colour the output in a way that is instantly recognisable to all dance music fans. When it’s used – When isn’t it used? You hear this everywhere. A low pass filter can be used to slowly introduce a vocal loop or piano line into the mix. A high pass filter can transform a break in a record, almost taking it out of the room entirely, before the DJ removes the effect, slamming the music in again. DJs love filters because they sound effortlessly good, and because they can help bring tracks to the fore or the rear of a mix, aiding mixing them together. Filters can be linked to the BPM, or more usually, are controlled manually by the DJ, slowly turning the knob or “tweaking” it to get intensely musical (and hopefully enjoyable) new frequencies and resonations out of the music. What are the extra parameters? – Because filters have often been “liberated” from the effects section and given their own knob, sometimes you ironically get less control here. If filter effects get their own knob, central is “dry”, turning left brings the LPF progressively in, and right brings the HPF progessively in. However, if filters are included as part of a classic effects section, they tend to be separated from each other, and you’ll get at the least control over the resonance (ie how much the sound is coloured as well as EQed) – basically, an intensity knob, that moves the effect away from simple EQ into something more musical. Imagine you put a long echo on a track – with echos fading off into the distance over say 10 seconds. If you turned the track’s fader down to zero, the echoes would carry on for 10 seconds because they’d already started, right? Yes – but only if the effect is “post” fader. If it is “pre” fader, turning the fader to zero will stop the sound entirely, even if there are effected sounds still remaining to “play out”. In other words, those effects will keep playing – but inaudibly, behind a closed fader. Post-fader effects can be a blessing (you can get some real musicality going by cutting the beats in and out with the fader), but also a curse (the track doesn’t turn off when you mix out of it!). Sometimes you get the choice. Don’t get hung up about it, but experiment and be aware how yours work. If you want to stop an effect completely, you can always turn it off using its on/off control. Some effects sections are pretty simple – maybe two effects sections, each tied to a channel, with a small number of effects, and the odd extra parameters. Multiple effects in Traktor Pro 2. At the other end of the scale, your software or hardware may offer you numerous effects within equally numerous effects sections, all of which can be applied to increasingly complicated variations of outputs, concurrently, or in certain orders and so on. What’s more, some equipment has effects built-in to the hardware as well as those offered by your software! Obviously, the more effects you have, the more you’re going to want to possibly use more than one at once on any given sound. “Daisychaining” refers to applying an effect to a channel, then “daisychaining” another onto that output. Clearly there’s lots of scope for creativity here. A simple use for daisychaining may be to apply a bit of reverb to a vocal microphone to make the singer sound nice, then add echo for effect. But there’s all sorts you can do – the trick is to work out what’s possible with your gear, and understand what you’re doing or you can very easily get lost. Hopefully, this short introduction has show you that your effects section is nothing to be scared of. The best thing you can do now is practise using whatever effects are in your system. I recommend finding a very simple intro to a song – a bassline, a beat and a percussion pattern – and looping just four bars of it. Then, go through your effects one by one, applying them to the loop to see what they do. Spending an hour with just a 4-bar loop playing will let you concentrate on what the effects are doing rather than the music, and show you just how radically you can change a few seconds of music with them. Try cutting the volume in and out and see how it sounds. Try cycling through all the available controls and parameters. You’ll soon find one or two effects that you want to start using. Have fun! Do you use the effects in your DJ software, or have you not done so up until now? Do you like it when you hear other DJs adding effects to their sets, or does it annoy you? Let us know your thoughts below. Probably the most important DDJT article to date. Learning how effects work is the foundation for elevating your mixes. Is it possible to apply the effects post-fader on an Xone:DX in Itch? Great article. Can we expect an intermediate and advanced version. I would like to read/see more examples of incorporating FX into your sets. Personally I sometimes get a bit carried away with FX and sometimes depending how I’m playing I forget all about them. Yes, that stuff is coming – there will be a whole series of effects-focused articles from now. Excellent! I think a lot of the tips and tricks articles should be done as a series. Like a Beginner>Intermediate>Pro series. In three articles, you should be able to cover what’s required to understand what you’re doing. The rest is always going to be practice. another marginally informed article from DDT…. Thanks for commenting. Happy to have your input but please, does it really take much extra effort to be constructive? What do you feel we could have done better here? This was a great tutorial Article that covered the basic if FXs very well. I look forward to seeing more articles in this same vein, ideally with some more focus on chain effects and a more in depth explanation of daisychaining. Keep up the great work, its really importante for someone to cover these basic ideas that most people wouldn’t bothering explaining. oh my oh my. i really needed this one. great one DDJT, great one Phil! Decent article. Could be worse, could be better. It’s all about Flanger Destruction! Great article. If there is one thing I would add to it, it would be “try not to use FX (live) unless absolutely called for”. The main idea is to find out what you can do with your tools and not what the tools can do for you (instead of you). I’m in total agreement with you, mix-man. Thats the better article in this website. 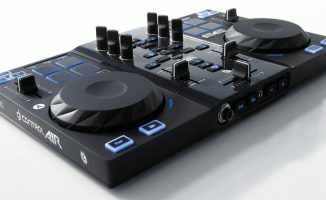 I’m using a DDJ-SX and have the roll buttons on the performance pads. I’ve seen a few videos where people with a DJM-800 have their roll effect with a dry-wet knob that allows them to bring in and out the roll gradually (ala a cross-fader). 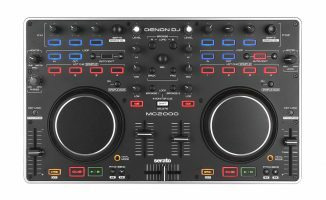 I can’t seem to find anything equivalent with what I have available through the DDJ-SX or through Serato DJ. Seems like there’s no equivalent of a roll effect, so that I could use the “dry/wet” or “effect level” type knobs in the FX section. Any ideas? Cheers for this Phil, do you know of any S2 effects tutorials? Im completely lost with the buttons next to the effects/filter knobs at the top, some stay lit up when you press them, some just go off straight away and ive no idea what effects are supposed to be on them. Was there ever a follow-up to this going over subtle differences and when to use more effects? For example, the roll in Rekordbox has some pretty sneaky features that come with it. The only part I disagree with in this article is the “Spending an hour with just a 4-bar loop”. You need to test the effects on the different styles of music you are mixing. A delay will not sound the same on vocals as a break beat.